Upper Deck Comes Up With a Big Assist in the Wedding of Two Hockey Lovers! 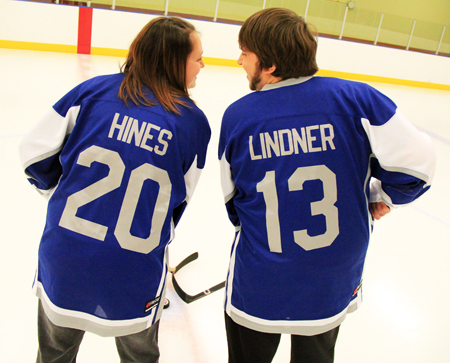 Pat Lindner is a hockey fan who asked his fiancé Shelley for her hand in marriage on the ice wearing matching hockey jerseys. So when he was reading the Upper Deck Blog and saw a story about how Upper Deck was looking to get involved with weddings for hockey fans, he reached out immediately. The wedding was just a couple weeks away so we worked with him on a fun way we could commemorate their union and in particular their memorable engagement. Upper Deck had a popular insert in the company’s SP Authentic trading card line called “Authentic Moments” so we thought this was certainly a moment worth paying tribute to. UD’s design team went to work and created a very cool collectible for the couple, their very own SP Authentic Moments trading card. Upper Deck will be sending the couple a blow-up version of the card they can display as a one-of-a-kind collectible. Congratulations Pat and Shelley!